I teach courses on biblical literature and on ancient Jewish and Christian history at the University of Oklahoma. OU is the flagship public institution of higher education in the heartland state called home by the Green family—principal founders and funders of the Museum of the Bible. When I joined the faculty three years ago, I inherited a general education course entitled “Introduction to the Bible,” a class intended to take students swiftly through the libraries of books collected over time and deemed biblical by a variety of stakeholders today. As a scholar of Second Temple Judaism and New Testament, I am trained to teach such a survey course. And yet my first reaction was horror. Not about the content, but about the title. Introduction to the Bible? Which Bible? Whose Bible? I’m confident I’m in good company with a host of biblical scholars who have had to explain to students that the definite article is misleading. “The Bible” is not a stable category. Christian tradition contains a variety of Bibles, and the Bible used by Jews is different from those used by Christians. The texts that are shared appear in different combinations and different orders, often with different Vorlagen. Jewish and Christian communities, moreover, disagree between and within themselves as to how to interpret these texts. The notion of a single Bible telegraphs unity when there is, in fact, much diversity. Given that the Green family, with whom (incidentally) some of my students attend church, are outspoken evangelical Christians, it perhaps comes as no surprise that their Bible museum might privilege the Protestant Bible. In the riveting book Bible Nation, Candida Moss and Joel Baden predicted that this would be the case on the basis, in part, of their careful close readings of traveling exhibits that were precursors to the Museum of the Bible (MOTB). For their part, the Greens and others affiliated with the museum have tried to distance the MOTB from such critiques. Two strategies they have used to do so invite interrogation. First, the MOTB has recruited Jewish and Catholic scholars as advisors and has cultivated public approval from religious leaders of both traditions. (As others have noted, Islam and the Church of Latter Day Saints are almost completely left out.) Secondly, they have claimed that the museum is doing no partisan interpretive work. In the words of both the museum’s director of collections, David Trobisch, and executive director Tony Zeiss: they let the Bible “speak for itself.” “Everyone” is apparently invited to have a voice and yet it is, ultimately, “the Bible” that is doing the talking. In an ironic way, their very effort to perform neutrality advances an idea about the Bible that is most at home in the evangelical Christianity of the Greens: this notion that the Bible can be unmediated is rooted in Protestant faith claims around sola scriptura, the theological belief that the Bible is the full revelation of God to humans, who need no intermediary tradition to interpret it. Today I want to integrate this critique with a focus on a different Christian theological proposition that I will argue is animating the museum’s presentation of material, and particularly of the Jewish Bible: supersessionism—that is, the belief common among (though not exclusive to) evangelicals that Christians have superseded, or replaced, Jews in the view of the God of Abraham, Isaac, and, well…Jesus. The museum’s Narrative of the Bible floor, whose purpose is to relay an overarching meta-story of the (museum’s) Bible has three sections: (1) A Hebrew Bible/Old Testament walk-through exhibit complete with retractable walls and theatrical smoke; (2) an imaginative re-creation of Nazareth from the time of Jesus; and (3) a seated film experience focusing on characters from the New Testament. As one enters the Hebrew Bible/Old Testament exhibit, a booming voice announces: “Tanakh, Old Testament, Septuagint, Hebrew Bible. It has many names. It contains many books, but tells one story.” Biblical scholars will recognize at least three problems with this: First, these names are actually referring to different bodies of literature. Secondly, there are divergent accounts of the same stories told within each body of literature. Finally, there are competing interpretations between Jews and Christians (and among Jews and among Christians) about the meaning of individual stories, about how the overall meta-narrative should be understood, and about how they figure themselves and others within it. Rather than recognize ambiguity or offer a variety of interpretations, this exhibit effectively collapses the Tanakh and the Old Testament. (And it’s the Protestant Old Testament here. No Hasmoneans in sight.) The exhibit ends with the return from Exile—a savvy attempt, I suspect, of dodging criticisms that would have been raised had it ended with the prophets that close out the Christian Old Testament, read in anticipation of Jesus, whom many Christians understand Israel’s prophets as having predicted. Yet the layout of this floor does the work that a Hebrew Bible experience cannot explicitly do: two-thirds of the exhibits on this floor at the museum point to Jesus. Quoting from the opening of the gospel of John (the fourth, not the first, book in the New Testament canon, nor the oldest of the canonical gospels), the museum’s New Testament film begins with the same line that opens the Hebrew Bible/Old Testament exhibit: “In the beginning” (Gen.1:1; John 1:1). This rhetorical move suggests to visitors that the Hebrew Bible/Old Testament and New Testament exhibits, and the literature they purport to represent, be read together. The parallelism itself is not the MOTB’s innovation, of course. The gospel of John, it could be argued, was the one doing biblical interpretation, mimicking the opening line of Genesis in order to suggest that Jesus as the Word was present with God from creation. But the New Testament film’s echo of the Hebrew Bible/Old Testament exhibit’s opening line —in combination with the museum’s claim to be presenting just “facts”—lures visitors into a false impression that it is a fact that Jesus not only was with God but was God. This is not a fact. It’s a theological claim. There is a rich history of interpretation and creative appropriation of the book of Genesis in both Jewish and Christian tradition. Notice, though, that the museum only presents here one later use of Genesis—a use determined by its signaling the New Testament as the seemingly natural complement to the Hebrew Bible/Old Testament. Yet historians know that this pairing is not neutral, but is itself a faith claim. This notion that the New Testament is a necessary part of the Bible normalizes a Christian accounting of what the Bible should be. Such an idea is most visible perhaps in the illumiNations exhibit on the museum’s History of the Bible floor. Here, the phrases “full Bible” and “complete Bible” are used to refer to a Christian canon. And yet Jewish literary activity did not stop, of course, with the books that now make up the Hebrew Bible. On the Narrative of the Bible floor, there is no exhibit for rabbinic literature, which could be argued is in many ways an analogous body of texts within Judaism to the New Testament within Christianity—except that it’s not today called “Bible” and this museum is, by virtue of its name, structurally conditioned to privilege literature that is called “Bible.” At the MOTB, it’s Christians who get to finish the story. Supersessionism, moreover, relies on the (unsustainable) notion that Judaism is “particularistic” and Christianity is “universalistic.” The implicit argument of supersessionism is that something that was originally local went global—it became available to all humanity. God made promises originally to ancient Israel, so the logic goes, but those promises became available to everyone with the advent of Christianity. On the Narrative of the Bible floor, this argument is implicitly signaled by the words that follow the introduction of the Hebrew Bible/Old Testament walk-through exhibit: “This presentation follows a narrative journey of a people, a nation, and a religion.” People. Nation. Religion. From the particular to the universal. Long ago, before the Bible was gathered into one book, it began as a collection of oral traditions and writings accessible only to a few people. Embraced by many communities with different traditions, the Bible moved from handwritten scrolls to manuscript codices, to printed books to mobile devices. Today the Bible thrives worldwide. How did it grow and spread? The MOTB has constructed and communicated a telos of the Bible’s formation. The end goal, as this exhibit frames it, is for the traditions of ancient Israel and Judah to overcome particularity and reach a worldwide audience. Notice the language in the first sign that visitors encounter upon passing through the doors into the exhibit (suggestively titled “In the Beginning”): “The Bible’s path to us spans thousands of years, crosses distant lands, and passes through many hands.” Pause for a moment with the image constructed here. “The Bible” appears to be a single entity. It is on a path to “us.” On its way, it “passes through” human hands. It’s important to ask: Who is “us”? And whose hands are conceived as delivering (as versus, say, producing) it? We might note here too that the idiom “heart language” has a long history in evangelical Christian discourse about missionizing. At the MOTB, the Jewish Bible gets swallowed up—made to function in service of this Christian-focused teleology. "Some visitors, the researchers realized, might even ask, ‘What is the Bible?’ There are, after all, so many. One exhibit on the History Floor focuses on the Bible and the multiple traditions that claim the Book as their own. This includes the Hebrew Bible, Samaritan Bible, Catholic Bible, Eastern Orthodox Bible, Oriental Orthodox Bible, Syrian Church Bible, and Protestant Bible. A combination of seven faith traditions with fourteen different Bibles spread among these groups. It’s complicated, but all part of the history of the Bible” (Lifting Up the Bible, 124). The rhetorical move that Summers makes here is revealing: an attempt to embrace complexity ends with framing the existence of diverse canons as part of the Bible’s history. The MOTB exhibit enacts this same maneuver as the wall of multiple canons comprises one stop on the visitors’ journey through the museum’s account of “the Bible’s path to us.” Yet, in reality, the existence of overlapping-yet-distinct canons is not merely part of the Bible’s history. This messiness of multiple Bibles is very much part of the present. Another effort at including a diversity of voices can be seen in the museum’s temporary exhibit spaces. Both the Vatican and the Israel Antiquities Authority have been given space for long-term exhibits on the first and fifth floors of the museum, respectively. But both are cordoned off—sealed within rooms that are spatially distinct from the Impact of the Bible, Narrative of the Bible, and History of the Bible exhibits designed by the MOTB. The Israel Antiquities Authority exhibit is desperately difficult to find. It’s the illumiNations exhibit, which celebrates work being done by evangelical Christian organizations, that has a permanent space featured prominently at the conclusion of the museum’s History of the Bible section. “Everyone” is invited to have a voice and yet it is, ultimately, the Protestant, Christian Bible that is doing the talking. And, what, according to the museum, does this Bible say? 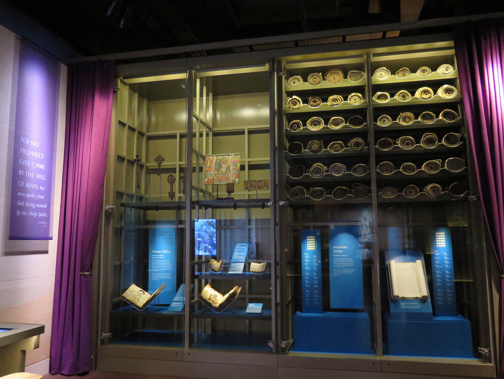 In the History of the Bible exhibit, the museum’s attempt to the let the Bible “speak for itself” is most noticeable on the prominent purple banners that punctuate the entire floor. Hovering overhead, these banners contain the English text of select verses from biblical texts. The chosen verses are thematically linked by their content: each has something positive to say about the “word(s)” of God (Jeremiah 1:9; 23:29; Isaiah 40:8; Psalm 33:4; 119:105; Proverbs 30:5; Matthew 24:35; Luke 8:11; John 17:17), “things written” (Romans 15:4), or “scripture(s)” deemed to be “inspired” (2 Timothy 3:16) and claimed to be pointing to Jesus (John 5:39). Biblical scholars know that none of these verses in their original historical and literary contexts refers to the Bible as moderns know it—and certainly not any version of a Christian Bible. When the prophets of Israel and Judah spoke about the “word” of God, they referred in a limited way to an utterance of God directed to (or through) them that was not necessarily written down at all (yet). The partial sentence from Deuteronomy 17:19 appears deliberately truncated to obscure its actual referent. The banner reads: “Let him read in it all his life, so that he may learn to revere the Lord his God” (NJPS). A glance at the preceding verses reveals that the pronoun “it” actually refers to a copy of Mosaic law revealed to Israel at Sinai, which Christians eventually came to believe was superseded by their own revelation from Israel’s God. In the context of a Bible museum whose exhibits point to Jesus, any visitor who didn’t know better would think that each of these verses was a self-referential claim about the Christian Bible. As such, these purple banners participate in what is fundamentally a supersessionist project: the subsuming of Jewish scriptures into Christian scriptures. In the Deuteronomy example, furthermore, if a visitor interprets the “it” to mean the Christian Bible (as I think is the intention), Mosaic law becomes literally replaced in the visitor’s imagination with a Christian category. To claim that “whatever they do prospers” is a bold promise in and of itself, but notice it is for those who delight in the “law of the Lord.” You could argue that the writer is specifically speaking of the law of Moses, which is, as we previously noted, the first five books of the Bible. But we believe that the phrase has a larger meaning and that it applies to the Bible as a whole (This Dangerous Book, 214). They quickly move on to the next verse without further reflection. The Greens here anachronistically equate the “law of Moses” with their own biblical books of Genesis through Deuteronomy, but the more important point to observe is that, for the Greens, the “whole” Bible is the Christian Bible. And the referent of Psalm 1:1-3—and presumably of Deuteronomy 17:19—is their Bible because “[they] believe.” And belief, it seems, apparently makes it so. This is theology, not history. It’s interpretation, not description. It’s faith, not fact. And it’s in the museum. A final purple banner demands particular analysis for its placement within the exhibit. In the course of their acquisition process, the Green family accumulated one of the largest collections of Torah Scrolls in the world. A dimly lit selection of them appears in the MOTB alongside a purple banner with a verse from 2 Peter: “For no prophecy ever came by the will of man: but men spake from God, being moved by the Holy Spirit (2 Peter 1:21 [ASV]; italics as such on the banner). This banner’s immediate proximity to the Torah Scrolls suggests their contents are prophecy, consistent with a Christian supersessionist notion that the “Old Testament” is to be read in expectation of the New. The Torah scrolls represent the superb accuracy of the Jewish people. The Bible, as we know it today, stands on the shoulders of the Jewish people and their attention to detail and vigilance in copying the text of the Old Testament for millennia (This Dangerous Book, 106). There is much to puzzle over—and bristle at—here: the unproblematized use of the moniker “Old Testament,” the assumption that there exists a monolith “the Jewish people,” the essentializing of “the Jewish people” merely as copiers/transmitters, the revealing use of the contrasting word “we,” the figure of the monolithic, essentialized “Jewish people” having a set of shoulders on which the Christian Bible is understood to stand. Notice the implied hierarchy in the imagery: Jews on bottom; Christians on top. Yet—some might object—Steve Green and his comrades did not make this Bible museum happen by themselves. Indeed, as I have already noted, one of their principal strategies of resisting criticism is to point to the involvement of all kinds of scholars, including Jews and Christians. In Lifting up The Bible, Cary Summers contends that: “The result of this combined effort [of scholars “including Jews and Christians”] is a wonderfully accurate, agenda-free, engaging historical depiction of the Bible” (Lifting Up the Bible, 126). But, much like the New Testament film on the Narrative of the Bible floor creatively takes a multiplicity of diverse voices and makes them speak from one mouthpiece through a single narrator, so the museum takes input from diverse scholars and flattens it into an account of “the Bible” that not only privileges the Protestant Bible but also betrays supersessionist thinking about the relationship of Christianity to Judaism. Analyze. Discover. Reflect. Share. Preserve. Explore. Reveal. Uncover. Engage. Learn. These words are consistent with a view of scholarship that sees researching biblical artifacts as uncovering something that is there to be found, something revealed, something we need merely to discover and then preserve and learn from. Absent from this list are verbs that I think critical biblical scholars would prefer to characterize what scholarship fundamentally entails: interrogate, weigh alternatives, recognize ambiguity and complexity, revise—and resubmit. Such is the nature of the academic process of the production of knowledge. And if the MOTB, which purports to represent cutting-edge biblical scholarship, were to submit for peer review its account of the relationship of Judaism to Christianity, there is one major flaw that this particular reviewer would dwell on. Here is my final, most concerning critique: there really is not a viable way for the MOTB to revise and resubmit its presentation—to “fix” it—because the institution’s formulation as the “Museum of the Bible” means that today’s (Protestant, Christian) Bible appears as a control when it really wasn’t one. In other words, the Museum of the Bible takes today’s Protestant Bible as the determining mechanism that controls what, which, and whose history is being told. By using today’s Christian Bible as an organizer of history, the museum has already determined the story it will tell—and where it’s going. In an interview with PBS NewsHour’s Jeffrey Brown about the opening of the MOTB, Steve Green referred to the institution (accidentally, I suspect) as a “museum to the Bible.” In Steve Green’s museum, the Bible is not just the subject. The Bible is also the object. The end goal. Yet if we take what any Christian Bible looks like now, and how it is related to the Jewish Bible, as the lens through which to understand the relationship of Judaism and Christianity, we get our history wrong. Doing so already anticipates the combining of the “Old Testament” with the documents that would come to make up the New Testament. Doing so inaccurately imports neat partitions that exist (or seem to exist) today onto the first couple centuries of the Christian movement. It also erases from view all other Jewish literary activity at the time because today’s (Christian) Bible becomes a retrospective lens through which history is being selected, organized, and presented. Earliest Christianity was but one (internally diverse) participant in a wider discursive universe in which pre-existing Jewish texts provided literary and theological resources for making sense of the world. When other Jewish voices from the first century are silenced, the Jesus movement (what would become Christianity) appears to be the natural—the only?—inheritor of the traditions of ancient Israel. On the History of the Bible floor, for example, visitors move quickly from the Israel/Judah section to a Dead Sea Scrolls stop to a brief Septuagint display and then to a presentation about the New Testament and (other) early Christian writings. The accompanying placard reads “A new message with Jewish roots.” In the museum, then, there is a neat progression from Tanakh to Christian adoption of the “Old Testament” and the addition of the New Testament. (In any discussion of canonization in the museum, “Jews” and “Christians” are treated as already distinct categories.) Such a move implies a neat progression from Judaism to Christianity, and it frames Christianity as the natural inheritor of the traditions of ancient Israel rather than—as critical historians would insist—as a group who eventually emerged as influential after a series of contingent events. If the Bible is, as Steve Green and others believe, God’s revelation to humanity and if God successively revealed to Jews and then to Christians, then the New Testament was the next necessary body of literature to be written and connected to the books deemed Old Testament. But what I (along with, I would guess, probably most other scholars teaching biblical studies courses from a critical perspective) aim to do in classes treating this literature is to disrupt the connection as natural, as inevitable—and to demonstrate in various ways that the New Testament’s production and connection to the books that would become “Old Testament” were the result of contingent events impacted by politics and happenstance. By contrast, the MOTB’s history implies necessity rather than contingency. It suggests that what did happen had to happen. But the connection of the “Old Testament” to the “New Testament” was not obvious to all early Jesus followers and it was certainly not universally held among first-century Jews. Because the MOTB has the predetermined category “Bible” as its subject and its object, the museum is selective about history, and the particular history that winds up being presented cannot help but affirm a supersessionist notion that Christianity (as distinct from Judaism) needed to follow Judaism, that it was the logical next step in a teleological march toward today. This is theology in the guise of history—the most dangerous kind. While making pretenses to neutrality, the MOTB is fundamentally a political project attempting to define what the Bible is and who owns it. Pushing back against such critique, Steve Green has commented to the Washington Post that the MOTB “has fence posts — limits. It doesn’t overtly say the Bible is good — that the Bible is true.” Instead, he says, the MOTB’s role is “to present facts and let people make their own decisions.” If the museum indeed has ideological “fence posts,” as Green claims to desire, those fences would make better neighbors of us all if the public face of the museum didn’t pretend those posts were in a place that they’re actually not. ***This article is based on viewings of the museum on December 14, 2017, and December 18, 2017. Jill Hicks-Keeton is Assistant Professor of Religious Studies at the University of Oklahoma. She is the author of Arguing with Aseneth: Gentile Access to Israel’s “Living God” in Jewish Antiquity (forthcoming from Oxford University Press). You can find more of her writing on the Museum of the Bible in Religion & Politics, here.